What is your experience in the brewing industry? Mario Bourgeois, co-founded a microbrewery in Casselman ON in 2012 working as the brewmaster. He worked in auto repair, farming and HVAC for many years and acquired great mechanical skills. It enabled him to put the brewery together and sourcing equipment. When time came to expand the brewery, Mario started looking for equipment and to buy directly from China. He gained valuable experience in sourcing such needed equipment and to gauge the quality that can be delivered. Where is the equipment coming from? We source our equipment from MICET – Jinan Innovative & Craft Beer Equipment. Co., Ltd located in Jinan, China. Throughout the years we have develop a strong friendship with the owner Nancy Chang and it enables us to work closely with her team of engineers and fabricators to ensure you get the best quality equipment. We are working hard together to become the #1 brewing equipment manufacturer in China. Isn't there any risk ordering from China? For sure there is. There have been countless nightmare stories from breweries who bought equipment from China and received nothing more than a chunk of stainless steel. There is always a risk of defect cause to be honest, if you want a perfect piece of brewing equipment you need to hire a North American brewing equipment manufacturer and you pay 2-3 times the price than an equipment built in China. When it comes to a startup brewery we know the money is tight and you can’t afford the Rolls Royce, this is where we come in. Equipment made in China will last you for decades and will still have some resale value. Our factory adheres to strict quality control we have put in place. All equipment is inspected before shipping by an independent inspector. Photos along with a detailed report is provided before we give the green light to ship the equipment. Any defect that wasn’t reported by our inspector will be fixed at your brewery and at no charge to you. What if there is a defect on the equipment I receive? There shouldn’t be any major defects on the equipment your order. All equipment is inspected throughout the production based on quality controls in place. A final inspection is performed before the equipment is sent. We also have shipping standards to make sure your equipment arrives to your brewery the way it left the factory. There will be some light scratches from the polishing, this is normal but it ain’t scratches that will harbour bacteria and compromise a batch. As for the exterior, we will repair any structural defects but minor aesthetic scratches and dents (if any) will stay. How long does it take to get my equipment? Brewery Trader is too small yet to stock in equipment but this will soon change. We count on satisfied clients to promote our equipment and grow to have stock of popular items. For the time being, from the day we get your deposit to the delivery we are looking at 90-150 days at your door delivery. Our leadtime will vary depending on our factory workload but we do like to keep honest leadtimes so there is no surprises except getting the equipment earlier that what it was suppose to. Yes, all vessels and filter housing have a warranty. 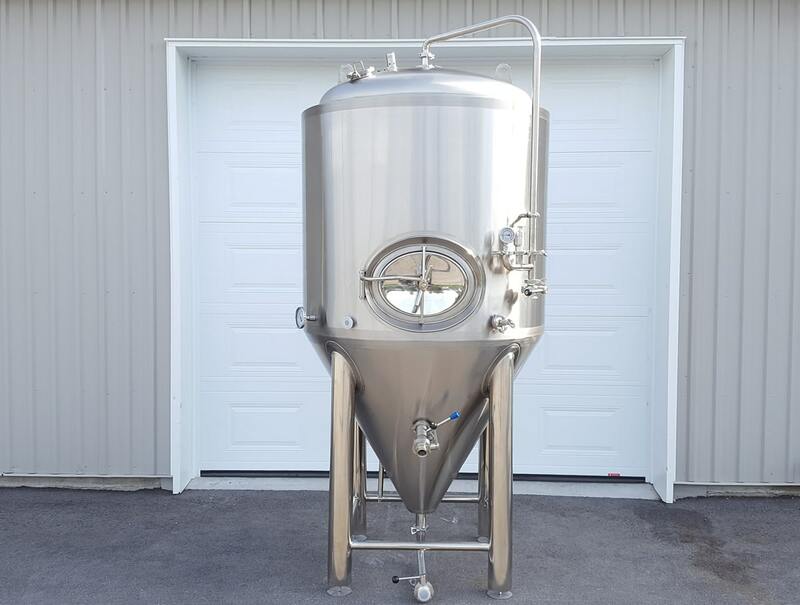 We offer a 5 year warranty on brewhouse, fermenters and brite tanks. Electrical motors have a one-year replacement warranty in the event it becomes defective. Pump seals are not covered under this warranty. Electrical components in control panels have a one-year warranty given it was installed by a licensed technician.